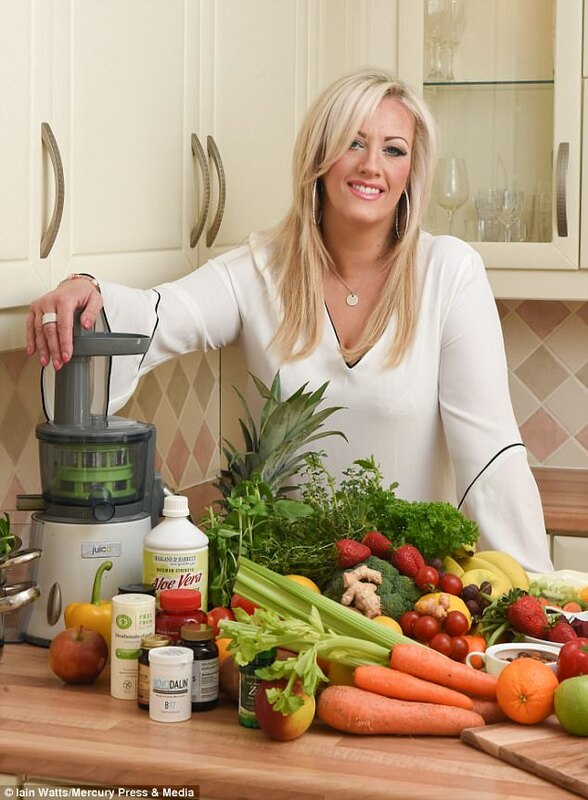 A single mum-of-three with terminal breast cancer claims she doesn’t need to say goodbye to her kids as she is ‘not going to die’ – despite rejecting chemo in favour of vegan juicing and positive thinking. After finding a small lump between her breasts while in the shower in May 2015, Marion Johnson was diagnosed with stage four breast cancer and given a year to live. Determined not to undergo more chemotherapy – as it had left her virtually bed-ridden and unable to enjoy time with her kids – Marion started to research alternative treatments. After looking into the benefits of cold press juicing and going vegan, Marion has rejected more chemo – against the advice of her oncologist – and instead overhauled her diet. Now six months after drastically changing her lifestyle to include oxygen treatment and daily vitamins, one of Marion’s tumours has shrunk while others are stable – and the mum is doing so ‘remarkably’ she claims nobody believes she has cancer. Marion aid: ‘When I told my oncologist what I was doing and that I would not have any more chemo he had a go at me and told me it was quackery, that I was wasting my time and money. ‘I just told him he hasn’t got a clue. He is a wonderful doctor but he only knows to do things his way. He wants to help and chemo is the only way he can see to help but it’s not. ‘Since I’ve changed my lifestyle one of my tumours has started to shrink and my blood work is perfect. Even the oncologist has admitted I’m remarkable. ‘I’m so well that when I tell people I have cancer they don’t believe me. And then I think they decide I must have one small, treatable tumour. Fruit and vegetable smoothie made in a cold press juicer that crushes and presses fresh ingredients to keep their nutrients in tact. Only organic eats organic produce. ‘I am 100 per cent certain I can reverse it. I don’t worry about what will happen to my kids after I’m gone because I’m not going to die. There’s no way I’m going to leave my children. 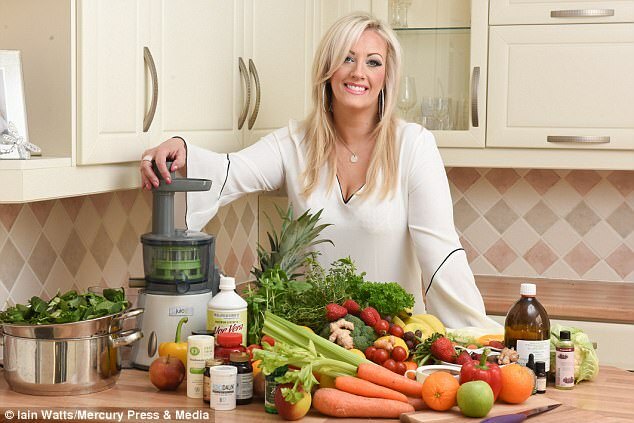 However, Dr Clare Morrison of MedExpress, a GP specialising in nutrition told Femail: ‘Overall, I believe that treating terminal cancer with a vegan diet is dangerous and unwise. After first discovering the lump, Marion was referred to Clatterbridge Cancer Centre in Bebington, Merseyside, for a biopsy and MRI scans. At first doctors thought they might be able to remove Marion’s breast and her lymph gland but further scans revealed tumours in her spine, stomach and adrenal glands. As her cancer was already so widespread, Marion’s only mainstream option left was palliative chemotherapy to prolong her life rather than combat the disease. Marion said: ‘I had to have really strong chemotherapy every three weeks for six months and it was awful. ‘The idea of losing my hair was so difficult because you know people will just look at you like a victim so I decided to try out a cold cap which basically freezes your scalp to stop the chemo affecting the hair follicles – it was excruciating. ‘After each round of chemo, I would come home and be okay for a couple of days and then it would hit me and I’d be completely wiped out. I’d basically just be in bed for nine days. ‘I was used to always being busy as a mum and then all of a sudden I could barely make it from the bed to the bathroom. It was horrible, I felt like an old woman. ‘My friends and family had to come round to help with the cooking and the housework. I just couldn’t believe laying there and going through that could be the only answer so I started to research. ‘Since then I have been researching and researching, trying to learn everything I can and applying it to my life. I have completely changed my lifestyle. 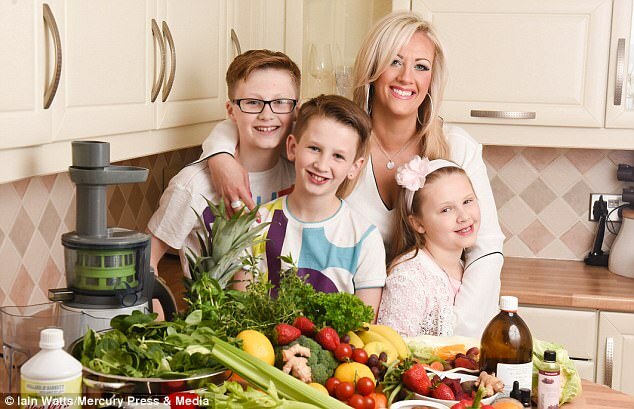 But determined to be a ‘healthy’ mum enjoying every moment of life she has left with her children Max, 11, Bailey, 10, and Ava, eight, now Marion has rejected traditional modern medicine for the more holistic approach. The former vehicle production operator starts every day with dandelion and burdock tea, lemon juice and a fruit and vegetable smoothie made in a cold press juicer, which crushes and presses fresh ingredients to keep their nutrients in tact. Marion has also given up meat, sugar, alcohol, gluten, and dairy products and only eats organic produce. Determined to boost her immune system and oxygen levels, Marion takes daily vitamin supplements, has a weekly vitamin C intravenous drips and uses a hyperbaric oxygen chamber. This delivers pure oxygen at higher than atmospheric pressures and is said to restore damaged cells and organs. And one of Marion’s friends has set up a gofundme page to get the mum to the Gerson Health Centre in Budapest, Hungary, which specialises in these alternative cancer therapies. While Marion’s family are the major driving force behind her determination to beat cancer, she is also keen to raise awareness and help others suffering from the disease. Marion said: ‘Getting that diagnosis was the biggest shock of my life, it was devastating. My first thought was my children and what they would do without me. ‘You hear the word cancer and you think you’re going to die. I completely broke down and I went through a really low time in my life. While Clatterbridge Cancer Centre NHS Foundation Trust could not comment on an individual case they ‘strongly advised’ patients to discuss their treatment with their own cancer doctor. A spokeswoman said: ‘We can’t comment on individual cases. ‘We would always strongly advise patients to discuss their treatment with their own cancer doctor and specialist team. ‘We treat more than 27,000 patients every year and in 2015/16 more than 47,000 outpatient chemotherapy treatments were administered. ‘I used to go into my kids’ bedrooms at night and just watch them sleep and think about how blessed I am to have them and how much I don’t want to leave them. It would just break my heart. ‘I remember once just staring at myself in the mirror and really staring into my soul wondering how this could have happened. One minute you’re just plodding through your life and then all of a sudden everything is turned upside down. ‘But it doesn’t have to be like that. I’ve completely turned things around mentally, I’m so positive now, and my kids and my family are what drives me forward. ‘I always tell them that I can’t promise them I will definitely get better but I can promise them that I am going to do everything in my power to try. ‘And I know I’m doing the right thing. I feel amazing, I feel so fit and healthy. I’m flooding my body with nutrients. ‘And without the chemo – without poisoning my body – the time I do have left with kids will be lived to the fullest and filled with happy memories, not just lying in bed.